Hire from Casino Hire London - the casino hire specialists. Established since 1994. Not all casino hire operators offer the same commitment to service, quality and customer care. Always here to help. Just wanted to say a HUGE thank you for providing such a wonderful service and aspect to my 50th party. You are right - it absolutely made the evening and was worth every penny. Everyone loved it, and the personalised money, and the prizes for the top three scorers went down a treat. All in all, a glistening extra layer to my party and one that truly broke the ice. And the two croupiers were absolutely first class - great fun, entertaining, dynamic and their warmth made people enjoy themselves to the max. Awesome! Many thanks again and I'm sure I'll be using you again in the future. Thank you Dominic for the booking. You want style, value and a casino night to remember - we've been providing a service for guests for over 26 years! Our authentic full size casino tables and wheels are the kind that you would find in a real casino, but you can only win as you won't lose any real cash. Our fantastic professional croupiers are of the highest calibre, of smart appearance and are simply great with your guests and clients. Our focus is on casino hire entertainment in a risk free environment and no real money changes hands. Fantastic for all parties and celebrations - the most interactive form of entertainment there is! You can raise funds for your club, charity, association or PTA - it's all perfectly legal. 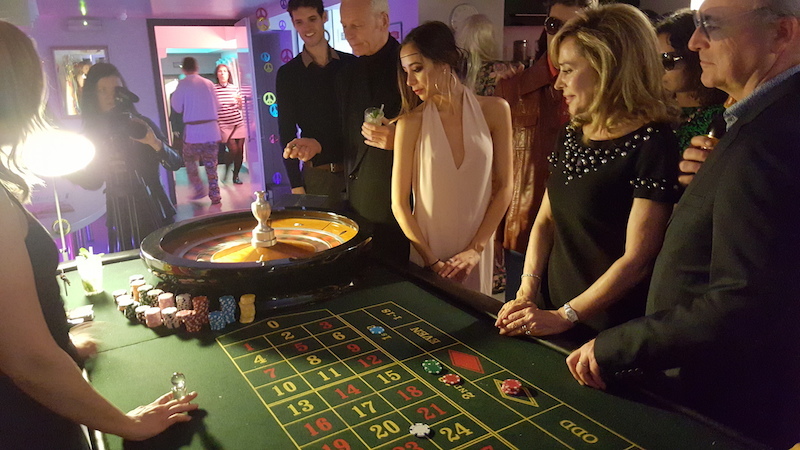 We also offer casino theme packages to enhance your casino party 007, Las Vegas, Hollywood, Wild West, Prohibition - well anything you like really, we can organise everything for you! Casino Hire London has been in the business of supplying fun casino entertainment since 1994. With over 30 full size casino tables for hire in stock we can do petite, medium and grand events. We are not the biggest casino hire operator you'll come across, however, Casino Hire London offers a very personal service for Clients - both old and new. Casino Hire London offers a seamless service and unique casino event experiences around London - whatever the weather, and wherever your event is being held. We do travel elsewhere, if required, and have done UK wide roadshows for Amazon, Diesel and Ralph Lauren. Even down to Provence for Legal Week too. You may only ever hire fun casino entertainment once in your life - so make the one perfect choice right here, right now. We only use our own pictures on this website - and there's a real person at the end of the phone - without a script... Let's have a chat about your event - we will make it extra special - that's a promise! Casino hire is great for all types of events and all ages. As a potential client, when considering all forms of event entertainment, casino table hire covers off most of the essential requirements for a successful event. It has interaction, provides excitement in a risk free environment as no money changes hands, just fun money, is incredibly cost effective as you can entertain lots of guests at a minimal per unit cost per head, and it is fun! Nearly every client chooses to go first with roulette hire. It is one of the oldest games and centuries old, has many legends of stories and even songs associated with it. Roulette is stylish, evokes charisma, is synonymous with James Bond and has many variations for different types of bets. Roulette is also very easy to pick up at the table and kids as well as the older generation love it. Roulette will always be a winner. If you are planning on a fundraising event, then casino nights come out on top. You can sell the casino night fun money to guests and get all the funds raised back to go into your fundraising pot. It's a chance to dress up, pretend you're rich for the night and gamble away like a demon. Blackjack hired alongside roulette makes a very popular mix of gaming tables for up to 80 guests. Think about addingin more tables if you are expecting larger numbers. A theme is always a good idea to make your investment into casino equipment hire really pay off. If you are having a family celebration then a casino night party is definitely one to have. An 18th, a 21st, 30th, 40th, 50th, 60th, 70th - well any age no need for an excuse to include fun casino hire into your festivities. Casino night hire is for anyone who wants to get everyone together, whatever the reason. Casino Hire London covers all of London and the outer limits too - we haven't been invited to entertain up in space as yet, but we'd definitely accept the invitation! Hire a casino for any event, at any time of year, for any occasion. Casino Hire London also runs and manages poker nights. We are a mobile casino operator of over twenty years standing. When you decide to hire casino equipment - choose the professional casino operator that brings a smile to your guests every time! With a bit of luck you'll choose Casino Hire London.